Bring the milk to a boil. When it starts boiling, reduce the heat and add lemon juice. Keep stirring till the water starts separating. Then switch off the gas and allow it to cool down. Pass it through a strainer and strain the water. Then transfer it to a muslin cloth and nicely squeeze till all the water has been removed. Now take the paneer in a bowl and knead well for a few minutes. Make small balls (approx 12) and keep ready. Take a pressure cooker and add water and sugar. Bring to a boil and wait till the sugar dissolves. Add the balls and close the lid. Reduce heat to medium and wait till 1 whistle. Then reduce heat to low and cook for 5 more minutes. Use a spoon to take out the pressure, and open the lid. 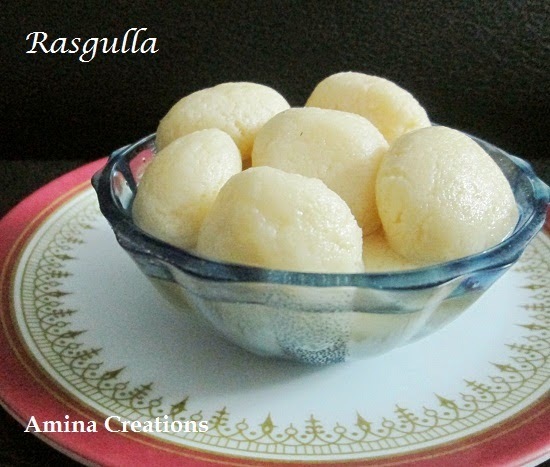 Allow the rasgullas to cool completely and refrigerate for at least 3 hours. They look so soft n delicious..nice recipe dear..